NEPALGUNJ, Nov 7: Paddy farmers here are forced to sell paddy at lower price because of import of cheap rice from India, loan repayments overdue and above all due to delays made by the Nepal Food Corporation (NFC)'s fixing prices for the grain. Manoj Kumar Sahu, a farmer of Udayapur, had to sell his harvest at Rs 1865 per quintal. Last year he had got Rs 2000 per quintal. Similarly another farmer, Rajit Ram Yadav from Hiraminiya, had harvested 20 quintals of rice this year. After paying a part of it to the field laborers he sold the rest to a trader at just Rs 1825 per quintal. Farmers like Manoj and Rajit are compelled to sell their harvest at low price due to financial reasons. While some of them have to repay their loans, others have to procure money for cultivation of winter crops. These farmers are getting lower prices for their paddy than last year at a time when inflation in other commodities is all time high. Farmers accused the local paddy traders of decreasing the prices of the paddy by importing cheap rice from India. “Since we get rice in cheap rates in India, we can't pay more than for local produce. The time our local farmers bring their crop for sale is the same time we get rice from India, so there's nothing we can do,” said Ganesh Gupta, a trader in Dhamboji. In the past, Nepal Food Corporation (NFC) used to determine the price of crops to safeguard the interest of these farmers along with buying their harvest at much higher price. But this year, it has done nothing yet. This has left the farmers with no option but to trade with local traders competing against cheap Indian rice. 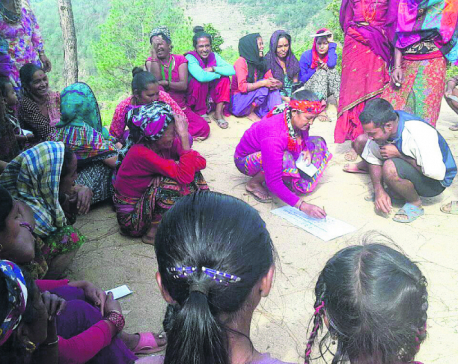 Jagat Basnet, acting Chief District Officer here said that the Corporation hasn't informed his office about a date to determine prices for this year's crop.